Unless you are strongly motivated by the thought of a glass of cold orange juice, a few pretzels and the occasional slice of cheese pizza, giving blood is probably not one of your Top Ten Things I Like to Do Best. Oh, the dogs may do it for the food reward. However, I think you’ll find that to their people, each unit of blood the dog donates represents the potential of saving a canine life, perhaps even that of their own companion. The owners of canine blood donors don’t do it for notoriety or money. They don’t visit The Animal Bloodmobile because they’re forced to. They don’t get their pictures in the newspaper or after so many pints, get a gold watch. They volunteer their dogs knowing that each unit donated will help enhance the quality of life of another animal. For them, that’s reward enough. So, what are these dogs in for? 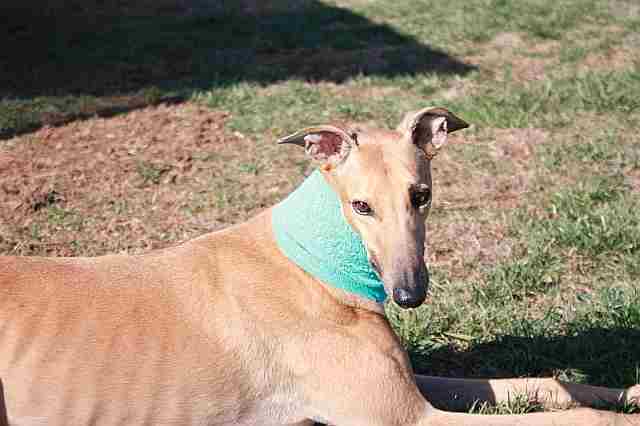 Just what happens when your Greyhound becomes a blood donor? Are there guidelines, qualifications, caveats? Yes, there are. Canine blood donors must weigh over 50 pounds. They must be in good health, be between the ages of one and eight years, be up to date on vaccines and have a willing temperament. If a canine is pregnant, has had or will have surgery or medications (mot counting thyroid or heartworm medications) within 30 days of the donor date or, again within 30 days, has had or will have annual vaccinations, it’s best to wait until the bloodmobile’s next visit. Approximately once every six weeks, parked at sites throughout Southeastern Pennsylvania, Southern New Jersey, Northern Maryland, and Delaware, The Animal Bloodmobile of the Veterinary Hospital of the University of Pennsylvania is available for canine blood donation. Inside the sterile environment of the bloodmobile, a veterinary nurse takes a blood sample from each potential donor. A portion of this sample is typed on the spot and the donor is tested for anemia. These simple tests determine the dog’s suitability as a donor based on its blood type and current health status. As with humans, dogs have one of several blood types. The characteristics of one blood type (DEA 1.1 Negative) are such that it can be safely transfused to any dog with any other blood type. Dogs with this type blood are known as “universal donors.” Greyhounds are one of the breeds with the greatest percentage of universal donors. The remainder of the blood sample is sent to the lab at VHUP where it is tested for the tick-borne diseases Ehrlichia, Babesia, Lyme and Rocky Mountain Spotted Fever. A complete blood chemistry screen, which checks for blood values, electrolyte levels, and general organ function is run on the sample. The test will also check for the presence of adult heartworms in the donor. Any abnormalities in any of the tests are immediately communicated to the owner and copies of the animal’s profile are made available to his or her own veterinarian. He’s Good to Go, Now What? The veterinary nurse and her technical assistant lift the dog onto the table and lay him or her on the right side. The owner is enlisted to sit at the dog’s head for comfort and to help the dog maintain the optimum position for drawing blood. The procedure is quick and painless. The veterinary nurses, many of whom have been participating in the blood donor program since it’s inception, explain each step of the procedure as it takes place. With the exception of the thrum of the GOMCO vacuum device, the mini-theater is quiet as questions are asked and information given in soft, modulated voices. It takes between 4 and 5 minutes for the pump to draw 400-450 milliliters of blood. Following the donation, the dog remains prone for a few minutes while the veterinary nurse applies pressure to the needle site. Before leaving the table, the dog is encouraged to sit (and it’s amazing the number of Greyhounds who do sit) and partake of the high-calorie, high-protein snack mentioned earlier. Donor dogs should be kept from strenuous physical activity for at least 24 hours. Owners are encouraged to be aware of any swelling or bleeding from the donation site as well as any atypical behavior on the part of their pet. In a matter of days, the dog’s body will have replaced the donated pint of blood and in two months, the dog will be ready to donate once again. The Animal Bloodmobile is an extension of the Penn Animal Blood Bank. Born of necessity in the 1980’s, the PABB was the brainchild of Donna Oakley, one of the original five nurses to be hired at the Veterinary Hospital of the University of Pennsylvania. Donna quickly became aware of the need for donor blood and blood products for the procedures and operations performed at VHUP. With the aid of the U of P faculty, staff and students and their pets, the Penn Animal Blood Bank became a reality. As grateful as she was for their assistance, Donna realized the University community was not large enough for the growing need for whole blood and blood products. In 1988, Donna took the concept of animal blood donations to the community, to breed clubs and to other special interest groups in the area. This outreach resulted in even greater on-site donations, but Donna knew there was an untapped quantity of potential canine blood donors in the suburbs of her Philadelphia hospital. In 1991, with the blessing of the Dodgen Corporation and the special interest and dedication of John Eastman, then an executive with Dodgen, Donna developed the concept of The Animal Bloodmobile. Together, they evaluated and delineated the requirements of such a vehicle and happily ended up with the specially outfitted Born Free Motor Coach. John Eastman delivered the motor coach to Donna personally on her birthday, a gift she will never forget. As founder and director of the Penn Animal Blood Bank and the bloodmobile program, Donna Oakley is justifiably proud and appreciative of the over 3000 participating donors that have been part of the program in the intervening years. are there any of these mobile units available on the west coast?? Mainly in the Seattle, Washington or north area??? the closest one that I am aware of is the wsu university over in Pullman, Washington school of vertinary medicine.